Thousands throng at the India Gate in Delhi to celebrate India’s 63rd Republic Day. 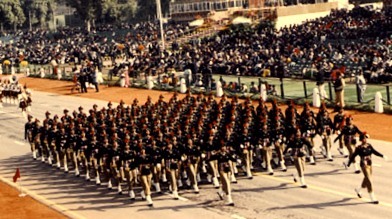 The customary Republic Parade, held every year, highlights the nation's achievements in various fields along with the military expertise, scintillating display of air power as also an assortment of the country's rich cultural heritage. This year the Agni-IV missile (3000 KMs Range) is the major highlight of the Republic Day Parade.The intermediate range surface-to-surface ballistic missile mounted on a road mobile launcher is being paraded by the Defence Research and Development Organization. The Air Force contingent comprising 144 men will be led by Flight Lieutenant Sneha Shekhawatthe first woman ever to lead an IAF contingent at the Parade. The Army's Mechanized Columns concludes with a flypast by the Advanced Light Helicopter Dhruv of the Army Aviation Corps.C-130-J Super Hercules tactical aircraft, Indian Airforce’s latest also makes it debut at the parade as well. The armaments put on display by the Indian Army includes the T-72 tank, Carrier Mortar Tracked, SMERCH Multiple Launch Rocket System, Pinaka Multi Barrel Rocket System, Full Width Mine Plough, NBC Water Purification Systems and Jammer Station VHF/UHF. The marching contingents of Navy comprising 144 men will be led by Lt. Commander Manikandan K.
Synchronized motor cycle stunts by Border Security Force, coordinated gymnastics by children for various parts of the country, Tableaux from 23 states and Central Ministries and Departments symbolizing historical, architectural and cultural heritage of the country are additional delights of the parade.